PARKING: From route 31 take Center road for 2.5 miles to Lyndeborough. Turn left onto Mountain road and follow it for 2 miles. The trailhead is on the left side of the road. There is room for 3-4 cars along the side of the road. From parking on mountain road follow the unnamed trail as it ascends a knob then drops steeply to a stream crossing, turns and ascends over an easy grade to the junction with Helen's trail. Continue on the named trail as it ascends a short and steep pitch through hardwoods soon emerging to the 1703 foot, The Pinnacle summit proper. The summit is marked with a cairn. The summit is mostly open and provides views towards Lyndeborough Mountain and Rose Mountain. Follow the snowmobile corridor as it winds it's way around the pinnacle summit area drops to the eastern side of the col, makes a sharp turn to the west and continues through the col. The snowmobile corridor makes a sharp right, merges with another corridor and passes the spur path to Lyndeborough Mountain. The spur path ascends a short pitch to the open summit where good views to the Pinnacle can be seen. Continue following the looping snowmobile corridor as it winds it's way towards the eastern side of Rose mountain, turns left and follows a contour on the southern slope winding it's way west to a merge with the Rose Mountain spur. The summit is a short 0.2 miles away. Rose mountain is the highest peak of the three and offers the best views of the area. The summit highpoint is a obvious rock bump that stands a few feet taller than it's surrounding. 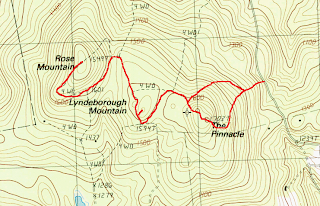 Rose Mountain is the 9th highest peak in Hillsborough County and 374th highest peak in New Hampshire. 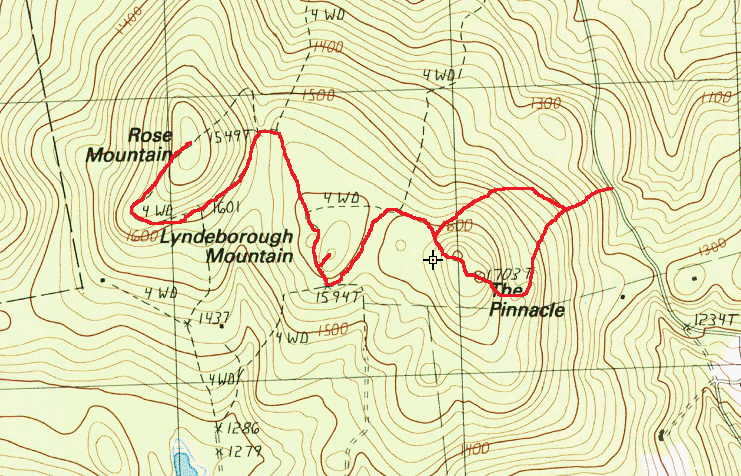 It is typically accessed from Mountain Road where a unnamed trail leads over "the Pinnacle and a snowmowbile corridor continues across the nearby Lyndeborough Mtn. summit and leads to Rose Mountain. Snowmobile corridor trail junction leading to Rose Mtn. Fire pit at the Lyndeborough Mtn. summit.